I know it’s been awhile since I’ve written. I’m not sure if I’m not spending enough time with God? Maybe God doesn’t want me writing as much as I used to write? Maybe I’ve just gotten lazy?! Either way today, I have something y’all need to hear! We are in an all out war! Drugs are stealing the future of many, many good people! Most of y’all know how addiction has affected our lives. Y’all also know, from reading my blogs, that God is in the healing, and restoration business! If I’ve said it once, I’ve said it a thousand times; as long as a person is still breathing there’s HOPE! 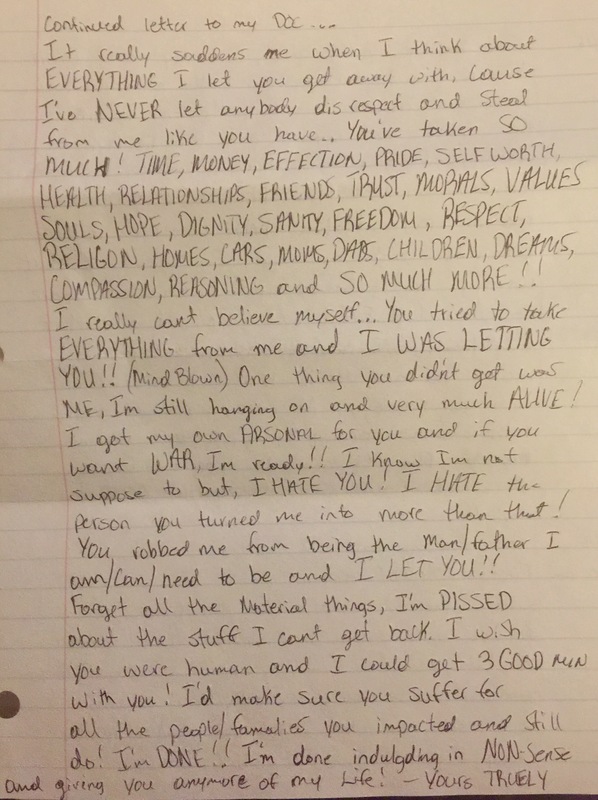 I want to share more excerpts from the journals I’m receiving from a heroin addict. Y’all, it’s so important to educate yourselves on addiction. Don’t think for one minute that you’re somehow immune to this affliction. It could happen to anyone, or anyone’s children! It happens to good people, bad people, Christians, nonchristians, white, black, educated, noneducated. Addiction knows no bounds! Pay attention! Be alert! Love addicts but, do it in a way that doesn’t enable!!! If a person stays in active addiction you never want it to be because you helped them! Sometimes loving people requires big boundaries! If you choose not to set those boundaries, you’re just as guilty as the dopeman!!! Anyway, I hope these letters shed light and wisdom into the mind of an addict. Friday, 9/30/16 – I had another dream last night, and no surprise! I woke up sweating but, this time it was bad! I really thought I had peed the bed until I smelled my sour self! Shouldn’t I be done with this stage? Is this normal?! It wasn’t a dream about shooting heroin, it was meth! I’m feeling kinda overwhelmed with anxiety which keeps me on edge. It’s best if I stay to myself on days like this. I have to say, I feel HONORED hat my journal was put into your blog…GOD WINK… I can’t pat myself on the back because I know this war is far from over! I’ve come to realize that I’m an expert procrastinator. I often know what I need to do and I just don’t do it! When I’m on dope I’m a POS. I’m truly ashamed of myself and my actions, especially the stealing! Come on, that’s NOT me! Saturday, 9/31/16 – The devil is at work HARD! Since I’ve been locked up, I’ve realized I haven’t completely given my life to God. I haven’t prayed the prayer for Him to take over, although I have asked for forgiveness. I now look at drugs like a bad spirit, or demon because essentially it is! Today I’m choosing to keep my thoughts and actions positive. Last week I questioned if God was real. I mean I wonder why things like molestation and murder have to happen. God reminded me that He sent the perfect and great Jesus to endure the pain and suffering of the world right? Then why should I be immune to suffering? I’ve endured the suffering of addiction, with so many other brothers and sisters, and God keeps people like me alive to help show others that God is very much alive and the battle can be won! So why me? Maybe God know I’m strong enough? Sunday, 10/1/16 – Don’t piss down my back and tell me it’s raining! The actions of a drug addict are not up for debate! We don’t HAVE to do anything, we CHOOSE to! That first high can never be reached again, although we constantly chase it. That pins and needles feeling. The smell of vinegar, and something about $20 bills…I guess because that’s what a sack costs. What would I do for that high, that rush or that buzz/nod??? I will lie, cheat, steal, take from my kids, screw over my family, and even go to jail/prison! YES I WILL! All for that feeling! And if the dopeman has some that’s making people fall over dead, I WANT THAT STUFF! That just means it’s real good or it’s tainted. Either way, I’ll take my chances! Yes, I will risk my life! Addicts medicate to kill the pain, and to fill a void. Every addict has a story. And until they really want help? It’s always a sob story! Look, God desperately wants to use these people whom the devil tries so hard to hold back! Let’s ban together and pray for those who suffer with addiction. Say a prayer for this young man who’s trying so hard to win this battle! Let’s stand in the gap for the least of these! If you need help let me know! I have a great hook up with The Pnuema Gallery! A nonprofit dedicated to helping people who find themselves in these situations! 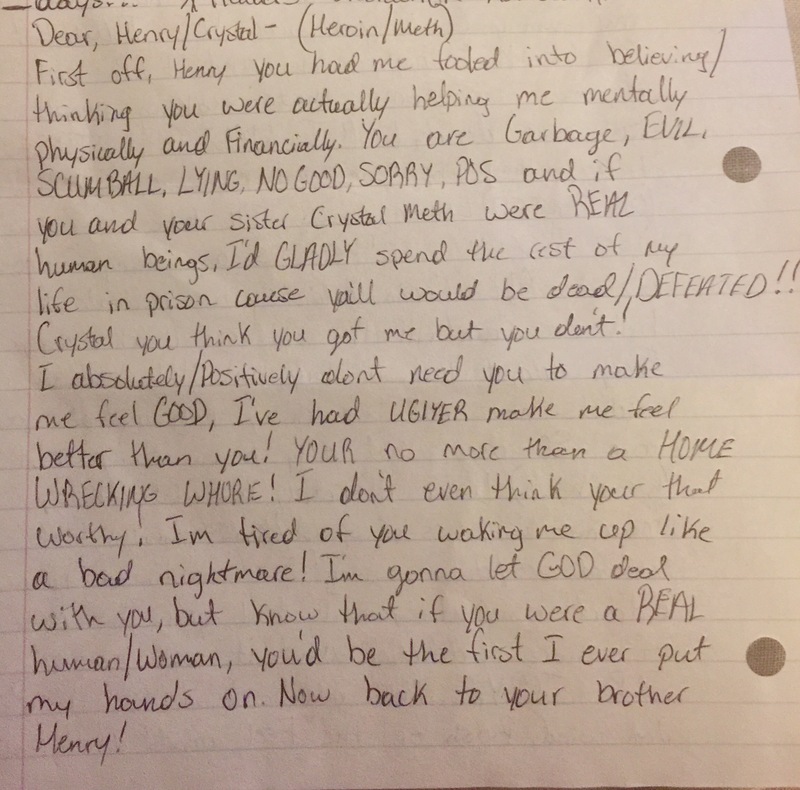 I’m going to close out this blog with a letter this young man wrote to his DOC (DRUG of choice). Please read this! Posted in Daily devotional.Tagged addiction, hope, Inspirational, ministry, recovery. Previous Post Come On! Let’s Walk A Mile In The Shoes Of A Heroin Addict! Next Post Wake Up! Pay Attention! And Grow A Pair!